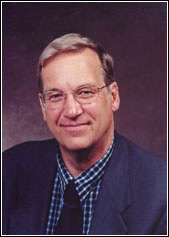 David Colander received his Ph.D. from Columbia University and has been the Christian A Johnson Distinguished Professor of Economics at Middlebury College, Middlebury, Vermont since 1982. In 2001-2002 he was the Kelly Professor of Distinguished Teaching at Princeton University. He has authored, co-authored, or edited over 35 books and 100 articles on a wide range of topics. His books have been, or are being, translated into a number of different languages, including Chinese, Bulgarian, Polish, Italian, and Spanish. He has been president of both the Eastern Economic Association and History of Economic Thought Society and is, or has been, on the editorial boards of numerous journals, including Journal of Economic Perspectives and the Journal of Economic Education. 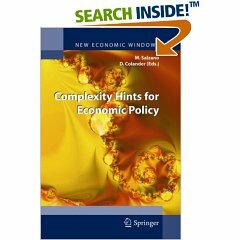 This volume extends the complexity approach to economics. This complexity approach is not a completely new way of doing economics, and that it is a replacement for existing economics, but rather the integration of some new analytic and computational techniques into economists bag of tools. It provides some alternative pattern generators, which can supplement existing approaches by providing an alternative way of finding patterns than be obtained by the traditional scientific approach. On this new kind of policy hints can be obtained. The reason why the complexity approach is taking hold now in economics is because the computing technology has advanced. This advance allows consideration of analytical systems that could not previously be considered by economists. Consideration of these systems suggested that the results of the "control-based" models might not extend easily to more complicated systems, and that we now have a methodpiggybacking computer assisted analysis onto analytic methodsto start generating patterns that might provide a supplement to the standard approach. It is that approach that we consider the complexity approach. The Making of an Economist, Redux is self-recommending. David Colander's work on the profession of economics is by far the best we have. A significant follow-up to his book of twenty years ago, it will become the standard account of what economics graduate school is like. David Colander is a member of a rare and valuable tribe -- an insider to economics who speaks clearly and introspectively to outsiders about what the insiders are doing. As the author of several textbooks, the Middlebury College professor has thought deeply about what teaching economics reveals about its research enterprise -- that is, about its attempt to explain the world. 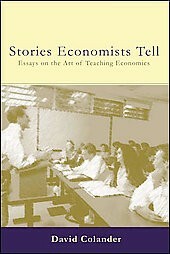 His just-published "The Stories Economists Tell," (a book so new, alas, that it cannot be found anywhere on the Web) contains sixteen essays that constitute a capstone course, of sorts, in teaching economics. Colander tackles many of the most pressing questions we have about the discipline: the role of formalization, the limitations of current theory, the place in history of John Maynard Keynes, the trade-offs between the creation of new knowledge about the economy and the conservation of the considerable store that has already been won. Members of this clan are not so rare, being fairly freely distributed in colleges and universities around the world, but they are always to be found in the best economics departments among the best American small colleges -- such as Swarthmore, Wellesley, Williams, Amherst, Grinnell, Carleton, Pomona and, in his case, Middlebury. "Research is nice," says Colander, "but good teaching is priceless." Macroeconomics is evolving in an almost dialectic fashion. The latest evolution is the development of a new synthesis that combines insights of new classical, new Keynesian and real business cycle traditions into a dynamic, stochastic general equilibrium (DSGE) model that serves as a foundation for thinking about macro policy. That new synthesis has opened up the door to a new antithesis, which is being driven by advances in computing power and analytic techniques. This new synthesis is coalescing around developments in complexity theory, automated general to specific econometric modeling, agent-based models, and non-linear and statistical dynamical models. 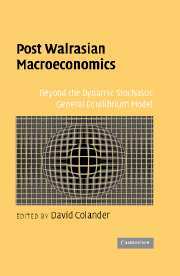 This book thus provides the reader with an introduction to what might be called a Post Walrasian research program that is developing as the antithesis of the Walrasian DSGE synthesis.